And "a little bit of everything" is not a permitted answer. 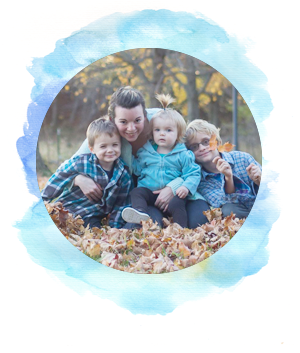 My blog is about my adventures through life and motherhood. It's about finding the balance between it all. It's about me discovering myself, trying new things, and defining who I am and who I want to be. It's about things I love or try to love (crafts, food, projects, etc) and sharing these things with other, possibly like-minded, people. I already touched a little bit on this in my 2014 goals, but here's a repeat and extension of that. Connect with other bloggers and blogs with relevant and/or interesting content. Have 3 guest bloggers by the end of 2014. Be a guest blogger on at least 3 different blogs by the end of 2014. Have 100 followers by the end of 2014. I'm not sure if this is realistic, but we'll see. A goal is a goal, right? Design or purchase a full blog design. Phew! That was a lot of goals! However, my blog is relatively extremely new, so I have a lot to look forward to and work on. Someone who is real and easy to relate to. Provides relevant information that is entertaining, informative, and/or helpful. Someone who is honest and upfront. No candy sugar coating BS here. I'm not really sure what else to write right now, since my "brand" is still very much in the works. I blog because I love the blogging community and all the possibilities it holds. I love the idea of reaching people on some level, whether I'm teaching them something, making them laugh, or making them cry. I love the idea of having an effect on people I don't even know. The thought alone is very empowering. Not only that but I like the idea of meeting new people (hopefully some in person) and connecting with people that I probably never would have had the opportunity to, if not for the blogging world. More than that, I blog in order to drive myself; you might even say to hold myself accountable. I blog in order to provide and find inspiration. I blog to find focus. I blog because I want to share useful tips, tutorials, etc, with others. I blog because I'm always in discovery mode when it comes to myself and blogging helps me find who I am. This question made me laugh a little. Even when not actively blogging or reading, I have blogs that I remember and love. Ana White, I Heart Nap Time, The Crumb Diaries, Insane in the Mom Brain, and House of the Smiths are all blogs I can remember off the top of my head because they've made that kind of impression on me. They are my heroes. However, I don't know any other bloggers on even a semi-personal level. While I'd definitely consider my blog and all my efforts a success if I could do it full time, I think there are other ways to be successful. Success for me would be having an active following of at least 100 people. Maybe when I reach that, I'll redefine my own success. Yes, I think I do. There are definitely times when I just give up. It's happened so many times to me and that's why I don't have 100 subscribers or 1000 posts. I always get distracted or disinterested. I'm flighty, what can I say? However, I love getting my words, my opinion out there. I am going to push, push, push myself so I can continue to be inspired in whatever ways I need. Can you answer these seven questions about your blog? What do you think about my answers?